We’ve been very busy at Cakes by Robin recently baking up a storm, and this is one of our latest creations! 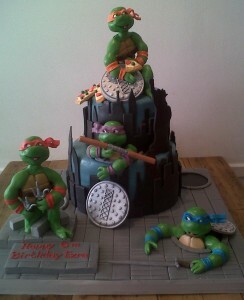 This Teenage Mutant Ninja Turtles birthday cake was created for one of our regular customers who wanted a cake to fit their New York theme. We wanted to create something really unique and special, and to keep the sugar models of the turtles within budget we decided to have them emerging from the manholes of the New York street in true Ninja Turtle style. For a bit of extra personalisation, we added the little pizza to tailor it perfectly to the customer’s wishes and give it a bit of a twist. Our decorators are brilliant at coming up with creative, interesting designs which will mean you don’t just get a standard, run-of-the-mill cake. Our customers come to us because they know they’ll get something different, and we always aim to please with our little finishing touches that will set our cakes apart from any others. The cake pops give the cake another little extra to really make it stand out and bring it bang up to date with the cake pop trend. It just goes to show that a cake doesn’t need to be complex to pack a real punch. The New York skyline, paving slabs, manholes and even the little pizza come together to make a fantastic themed cake without being over the top, and it shows that you don’t need to spend a fortune on big flashy flourishes to get yourself a fantastic cake. We are able to cater to any budget, and even if you’re trying to keep costs down a little it doesn’t mean we can’t produce a beautiful birthday cake to make your celebration go with a bang!